Studies concerning snoring, and its connection to your health have shown that the “annoying sound” can affect, not only your health, but the health of your partner as well. This subject has such a significant impact on the health of over half of the population, that we have decided to discuss the causes, risks, complications and potential screenings of snoring. Snoring is noise produced during sleep as air passes through the throat and causes the soft tissues to vibrate. Men, women and children all snore, though it occurs more frequently in men and people who are overweight. Occasional snoring is usually not very serious, and is mostly just an annoyance to anyone sleeping within earshot. If you are a habitual snorer, however, you not only disrupt the sleep quality of those close to you, but you may be at risk for obstructive sleep apnea (OSA). Fifty percent of snorers have OSA. The assessment to the right is an easy way to see if you may be suffering from sleep apnea. Please note that it is not 100% accurate or guaranteed. Heavy snorers have a significantly higher risk of carotid atherosclerosis, the narrowing of the arteries in the neck due to fatty deposits, which increases your risk of stroke. The risk of stroke doubles in men with mild sleep apnea and triples in men with moderate to severe sleep apnea. Sleep disordered breathing can increase stroke risk by lending to, or worsening, hypertension and heart disease, and possibly causing reductions in cerebral blood flow. Snoring is more than an embarrassing side effect of sleep, and should not be ignored. If you or a loved one snores, they may be at risk of OSA. If you are not sure, snoring could be a wake-up call to discuss with your doctor. 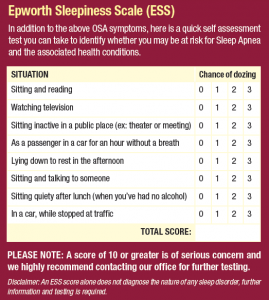 A simple screening test that measures your oxygen levels and pulse during the night can help determine if you need a study conducted at a sleep lab to determine if you have OSA. If you live near Sidney, OH and think you may be suffering from Sleep Apnea, consider scheduling a consultation with Dr. Van Treese. Dr. Van Treese is offering a COMPLIMENTARY initial consultation and a COMPLIMENTARY in-home sleep screening, for a limited time only (through 10/31/2016). He can suggest a treatment that is right for you. Please contact us today!